If you're a foodie, you would have been catching up the latest season of MasterChef Australia on Lifetime (Astro channel 709) but for those who don't but is still a fan of MasterChef series, remember to tune in every weeknights at 7.00pm and 11.00pm. 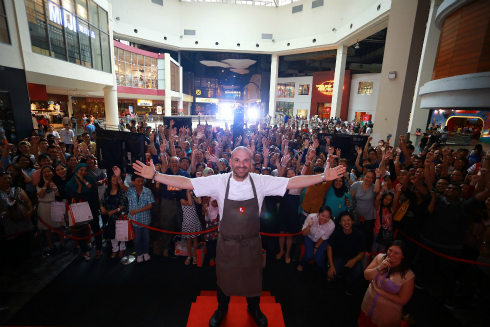 In conjunction with this, A+E Networks who runs Lifetime, brought in one of the beloved judge of MasterChef Australia, George Calombaris, for a promotional tour of Kuala Lumpur, Singapore and Jakarta. I was checking my Instagram (look for babe_kl) on late Saturday night and saw George posted that he's on his way to Kuala Lumpur. Wow so late and I know he has a meet the fans session at MidValley Megamall at 2.00pm on Sunday. Anyway, I knew via Lifetime's website that they have asked fans to vote for dishes to be presented to George to try during this session. The final top 3 dishes were Nasi Kerabu, Assam Laksa and Orh Jien (Penang Style Oyster Omelette). 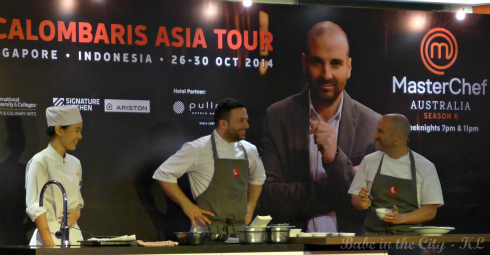 We have the privilege to be invited to a dinner cooked by George and his team held at Pullman Hotel, Bangsar. When BoiBoi found out that we're going for this dinner and he had to go back to the gramps for the night, he literally "beg" his daddy to let him go in his place. Many pleases went and the daddy was happy to allow him to and there went our "date night" haha. 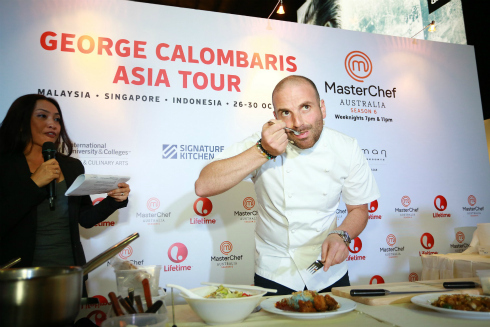 During the introduction, we were told by Charles Less, ‎Head of Advertisng Sales at A+E Networks Asia that viewership of MasterChef Australia S6 overtook MasterChef USA S5 by 15%. That's quite an amazing fete. George was introduced later on amidst thunderous applauds. After some banters, he took out a list from his pocket and read out what food he has tasted so far in KL. Lots of yummy dishes listed such as nasi lemak, Hokkien mee, hor fun, rojak etc but not long enough to taste many others delicious fare we have in Malaysia. When asked which is his favourite so far and he was quick to name (fruit) rojak. He loves the flavour and various textures in the fruit rojak. 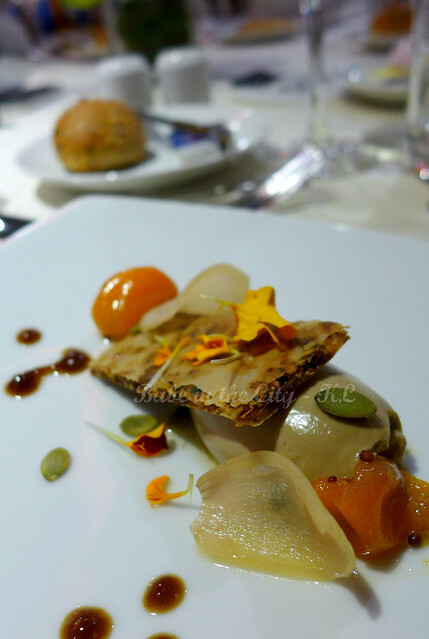 We were served the first course of Chicken Parfait with Bitter Chocolate Baklava, Coffee, Cumquat, Pickled Onion & Pumpkin Seeds which is essentially creamy chicken liver pâté which went with crunchy flat baklava. The pâté portion was quite substantially, enough to be spread on dinner roll. Sounds like a train of ingredients on the plate but each of them complimented each other perfectly. 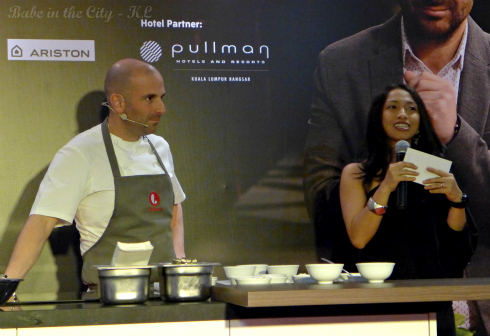 Next on he took to the stage to demonstrate the next course of Green Greek Salad with Stir Fry Abalone with a female student (sorry didn't catch her name) Inti International University & Colleges who is one of the sponsor. Once he's done, he turned the table around and asked her to be the judge of his dish. She gave him full marks for his effort, of course. The whole dish basically looked green which well got BoiBoi a bit skeptical to try. He poked around and got round to taste the crispy kale and green feta puree. 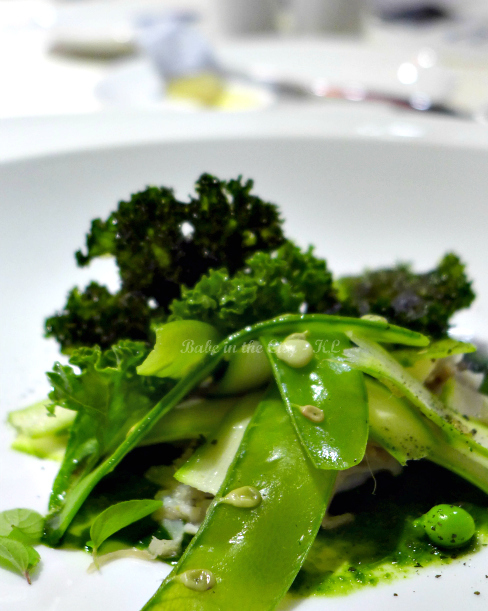 Nothing beat fresh stir fried abalone slices that went along with cheese puree, slivers of asparagus & peas and crispy kale. Main course is on next. We get to see George preparing the chicken rolls on live feed. This time round he has a male student to assist him. 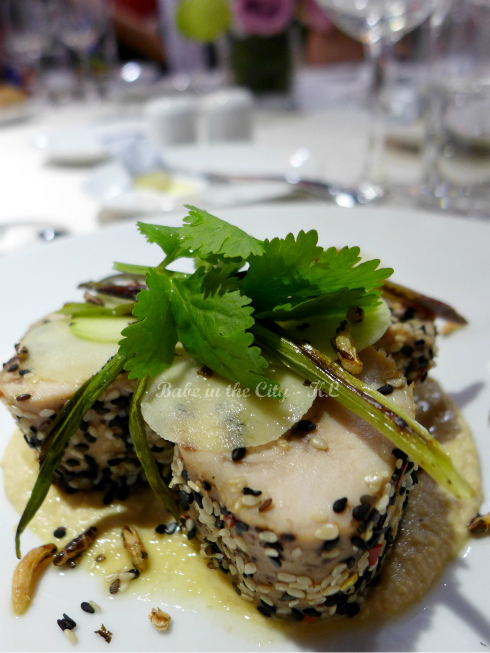 Once he plated up his Poached Chicken with Miso Hummus & Green Mango Salad, George got him to taste. Full marks for this dish too! George replied that one would usually need to come earlier to recce the ingredients available in the country, check out the freshest ingredients and spices locally and try to use them to incorporate the different elements of the dishes. 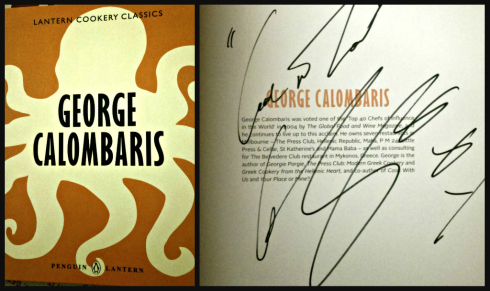 For that effort, BoiBoi was presented an autographed copy of George's cook book. BoiBoi is very proud of this and hopefully he will get round to cook some of the dishes in the book. 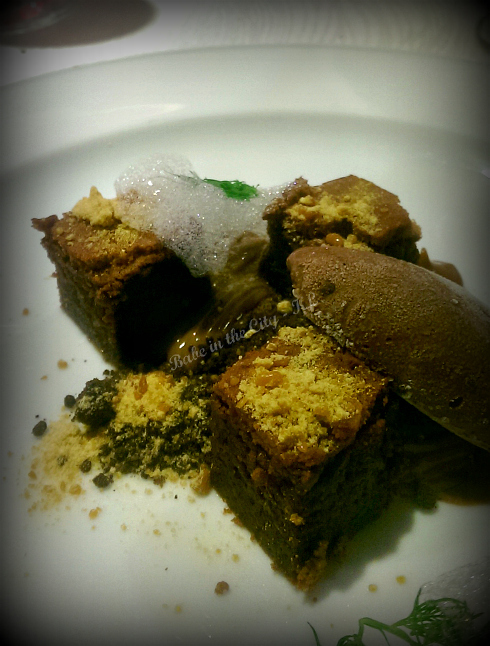 Lastly, dessert simply named as Chocolate Cake was served. Such simple name but you can see there are a lot of going-ons on the plate! There's the chocolate cake, chocolatey sauce, dark chocolate soil, chocolate ice cream, some yellow crumbs which I thought it was crushed honeycomb and hmmm foam which I think it's fennel but none of us could guess what it was. Everyone around the table went yuummmm mmmmmm on this one. BoiBoi and I would like to thank Rubini, Janet, Hui Jun, the good people of A+E Networks Asia for the most memorable invite ever for both of us. Thank you George too for being so accommodating! 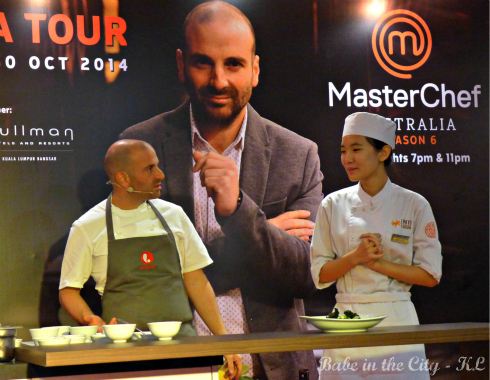 You may follow George Calombaris @gcalombaris on Twitter & Instagram and Facebook Page. There's no secret that we love our ramen and virtually tried quite a number of them around town. Capt'n Hook loves the strong broth taste, hence if by any chance there's a ramen place around, we will definitely be heading there for dinner. So by now, we have a few favourites and are so happy that we can find Ippudo at The Gardens and the latest outlet at Bangsar Shopping Complex. Don't need to weave through the traffic jam to Pavilion KL. To start off, BoiBoi picked Curry Cheese Harumaki and the Buta Karaage as our appetisers. All of us love the Curry Cheese Harumaki. To me, it reminds me of curry puff but this comes as deep fried spring rolls with a filling of mild curried potatoes, mince pork with cheese. The Buta Karaage turned out to be deep fried pork loin which is juicy on the inside but yet crispy on the outside. Best when dipped in the special sauce. There were 3 types of ramens to pick from but the waitress recommended us to order all the three so that we can share and taste all of them. How sweet of her and pretty wise choice I would say. Let's get the low down of ramen here in Ippudo. One can pick the texture of the ramen ranging from soft, normal, hard to very hard. Apparently, normal and hard are KLites' favourites. They even have straight or crinkled noodles. As for the broth, all of them have the basic cloudy white tonkotsu (pork bone) broth. The variations would have different ingredients added changing the basic flavour completely such as the addition of miso paste, spicy miso paste or fragrant garlic oil. The toppings have the standard pork loin slices, kikurage (black fungus strips) and spring onions. You may add soft boiled egg or chashu separately. As for the condiments, there will be a bowl of fresh garlic that comes with a garlic press, sesame seeds that came in a grinder and Togarashi. Try the broth on its own first before deciding if you need to add any of these. They started us off with the mildest flavour, Shiromaru Motoaji with the basic tonkotsu broth paired with normal thin noodles. The broth is not overpowering at Ippudo, just nice for me but for someone like Capt'n Hook, he pressed in one pip of fresh garlic. I took a sip and gee the fresh garlic took the broth to another level. We were given the soft straight noodles here, nice. The next bowl of ramen, Akamaru Shinaji. This bowl has a special miso paste and fragrant garlic oil added to the tonkotsu broth. This miso paste is mildly spicy and we loved it that the garlic oil is so fragrant that Capt'n Hook does not need to press in any fresh garlic. I quite like the normal noodles texture. I have some comments written by BoiBoi on his phone while we were in the midst of eating and he emailed to me so that I could put up here, so those in block quotes and in blue were written by him ;-) atta boy! Akamaru Shinaji ramen is a bit spicy here. Well, it consists of pork belly (of course it's obvious), thin noodles, some kikurage, spring onions and special blended miso. This tastes better when sesame seeds were grounded over. Mmmmm.........spiciness during the cold weather is best. Our last bowl is Kataka-men which has spicy miso, minced pork & some chopped cashew nuts over tonkotsu broth, paired with hard wavy noodles. Personally, I quite like this combi but would opt for normal noodles as I find the hard noodles a bit high on the al dente side. I would say adding extra grounded sesame seeds lend a nuttier taste to the broth. This is "The Spicy" ramen among the three. It seems to be Ippudo's original tonkatsu broth with spicy miso, cashew nuts and ground pork. It too also has pork belly and some garlic. Good for keeping away Dracula. Actually, it's not that spicy though. My spiciness level is divide the nasi lemak sambal by 2 and add some garlic anddd voila! You got that spiciness. When we first tasted Ippudo's soft boiled eggs not long after their opening, we got disappointed with the over cooked yolk. When we gave Eddie, the Outlet Manager, the feedback, he quickly got us one egg to try. Needless to say, the egg fans in the family were mighty glad to report that this time round the egg was made perfectly. It has soft white with runny yolk... BoiBoi called it lava overflowing heh! Photo was taken by him. I have got an additional review here! Yayyy. This is a lava egg (lava egg = runny yolk) that has been broken into 2. Bad news for Humpty Dumpty. Thank you to Eddie for being the perfect host and Sharyn of Ippudo Malaysia for the invite. We have to stop blogging by the third quarter of last year as we were busy packing to move. You have no idea how much stuff we have hoarded over the past 13 years even though I constantly spring clean my stuff. That too I have been very careful what to buy after a major kitchen cabinets spring cleaning 4 years ago. Instead of my usual "asking myself 3 times if I really really needed the item before every purchase" I have been doing like dozens of questions just so I don't take up so much storage space! Crazy crazy! Capt'n Hook have more rubbish stuff than ever including decade old gadget boxes complete with manual, cables etc. Imagine it's not only packing but sieving through all his stuff, awww gawwddd! His study room alone took us weeks to sieve and pack up. The best thing though is now we no longer staying so far away to the south of Kuala Lumpur. Our friends used to teased us that they needed to bring their passports along when they visit us duh. We are now located on the northern part of Kuala Lumpur with easy access to many places. Such a relieve now I would say. If you're still with me, thank you so much!